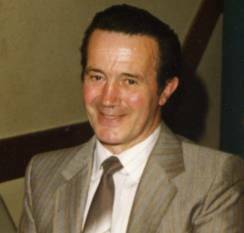 However, Pat has always made the most of life and he had many fond memories of his childhood, playing with friends in unspoilt meadows, woods and ponds, walking his dog and riding the farm horses. This love of the countryside remained with him throughout his life and Pat was always happiest when excavating at a remote rural location surrounded by the sights, sounds and smells which reminded him of his childhood adventures. Pat met his wife to be Betty, at a fair in Tiptree in 1950. After being apart while Pat trained as an aircraft engine mechanic during his National Service, Betty and Pat married in 1955 and Pat moved to Tiptree. Pat soon became a very popular member of the local community. He worked initially for a local builder and then ran his own building business in the village. In 1962 Pat joined the local Fire Brigade in which he made many close friends during his 26 years service. Pat was so eager not to arrive late at the Fire Station for his first shout that when the siren sounded he forgot that he was working on a bungalow roof, dropped his tools, ran down the roof and fortunately had a safe landing in a heap of sand! After leaving the building trade Pat later worked as a Shipwright for Colvic Craft at Witham. Pat’s main interest was archaeology and through his enthusiasm and determined hard work he discovered, excavated & recorded a number of sites, some of national importance, mainly around the Blackwater estuary area in Essex. One of Pat’s favourite activities was finding new archaeological sites as cropmarks from the air. He and his son Kelvin spent much time together flying and piecing together the ancient landscape of the Blackwater, Colne and Stour valleys. Pat’s first job was as a Woodman’s assistant on the Birch Hall estate. It was probably this experience together with growing up in a small rural community which helped him to understand how man was able to work in harmony with nature. He had hands-on experience of the environmentally sustainable practices of hedge laying, coppicing, hurdle making, charcoal making etc. and was able to call upon this experience in interpreting archaeological evidence from his excavations. Most of Pat’s discoveries were made in the 1980’s under very difficult salvage excavation conditions. In which Pat would follow the tracks of box scrapper machinery in the process of topsoil clearing on gravel extraction sites. Pat worked usually single-handed, shifting hundreds of tons of soil by shovel and trowel, through all weather conditions. investigations. This vital co-operation resulted in the discovery and recording of many sites which would otherwise have been totally lost without trace. Pat amazed many professional archaeologist by his “sixth sense” for finding features from the most subtle marks in the subsoil. He was also adept at divining and produced remarkably accurate plots of features by this method. Pat’s dedication to archaeology was acknowledged when he was awarded a British Archaeological Award in 1988 for his excavation work in advance of gravel extraction (photo). Pat was also interested in local history and genealogy. He collected and presented an album of old photographs of Birch Primary School to the school on their Centenary. He also made records of churchyards and he recorded all of the monumental inscriptions in the churchyard of St Luke’s Church, Tiptree. Pat made many presentations to local groups on his archaeological and local history work. Following complications after a routine operation in 1997, Pat suffered a heart attack. Having accepted that he would have to slow down and give up his strenuous hobbies he was then faced with a devastating blow in 2001 when he was diagnosed to have a terminal lung condition (Mesothelioma). Unfortunately, this meant that Pat was unable to complete the processing and reporting from many of his excavations, which he had planned for his retirement. Despite suffering a long and painful illness Pat remained positive and was determined to fight back, remaining his usual friendly cheerful self. Pat continued to make the most of things almost to the end and enjoyed the simple pleasures of life. He always looked forward to rides out in the familiar countryside of his childhood and revisiting sites of his excavations with his wife Betty and his children Kelvin and Lorraine. Pat was a true “salt of the earth” whose warm friendly smile will be sadly missed by all who knew him. Pat leaves a wife Betty, son Kelvin and daughter Lorraine.